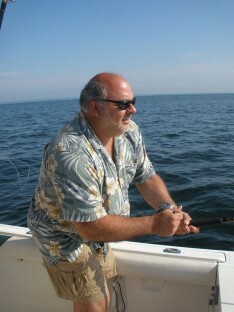 Free Fishing Reports > Northeast > New York > North Shore > Lou and John treated to Bass and Fluke bite! 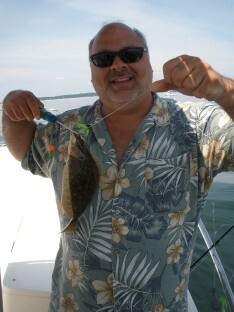 Lou's 1st Fluke...what a giant! 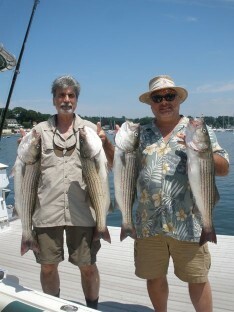 On a beautiful, calm morning, Lou and John were treated to a nice bite of Striped Bass! 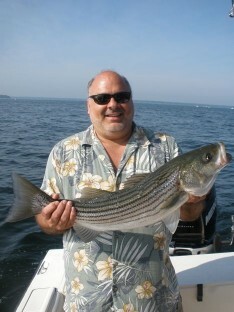 This was Lou’s 1st ever fishing trip, and surprising, he fished like an experienced angler. The crew limited out with fish to 33″, and had a few throw-backs as well. Capt. Skip and the boys set sights on some Fluking! The trio had over 3 dozen fish from 13″-20″. The bite was non-stop, but no keepers aboard for the dinner plate. (gee, I guess we will have to eat Bass for dinner)! Overall, a great time was had by all!